Though Cadillac’s eighth-generation Eldorado had been in production since the 1979 model year, 1982 was the first year for the Touring Coupe edition of the Eldorado. The Touring Coupe marked the first even remotely sporting Eldorado in many years. Newly standard for the 1982 Eldorado and available on all Cadillacs except the Cimarron was the HT-4100 4.1 liter/249 ci V8 with throttle-body fuel injection. Unfortunately, horsepower for this all-new engine was an unimpressive 135 bhp—somewhat of an issue when you considered the Eldorado’s platform mates. Buick’s Riviera T TYPE had a 170 bhp turbocharged V6, and Oldsmobile’s Toronado was available with a 150 bhp V8. 0-60 mph took around 14 seconds in the approximately 3,700-pound Eldorado, while the Riviera T TYPE was about four seconds faster. Fuel mileage with the new engine was 17 city/27 highway by the standards of the day (14/20 by today’s standards). With a 20.4-gallon fuel tank, an Eldorado owner could expect a range of 310 to 405 miles with a 10% fuel reserve. Standard exterior and mechanical equipment in the $20,666 Eldorado Touring Coupe (about $55,600 in 2018 dollars or about what a loaded 2019 Cadillac ATS coupe goes for) included Touring Suspension and P225/70R15 blackwall tires (a size still readily available) on 15-inch aluminum alloy wheels. Inside, reclining bucket seats, a leather-wrapped steering wheel, and a front seat console were all part of the Touring Coupe experience. Standard exterior and mechanical equipment on any 1982 Eldorado included front-wheel drive, a four-wheel independent suspension, power steering, tungsten halogen highbeam headlamps, and four-wheel power disc brakes. Inside, Twilight Sentinel, power door locks, power windows, side window defoggers, remote trunk release, electronic climate control with outside temperature display, a six-way power seat for the driver, and an electronically tuned AM/FM stereo radio with power antenna were all included. Options included Astroroof ($1,195), electronic cruise control ($175), tilt/telescope steering wheel ($169), and Symphonic Sound System ($290). Eldorado Touring Coupe page from the 1982 Cadillac brochure, linked from the Old Car Manual Project’s amazing brochures section. The Eldorado Touring Coupe got reasonably even-handed (perhaps a little surprised) reviews from the “buff books,” but didn’t sell very well. First-year sales of 1,700 units (about 3% of overall Eldorado production) declined every year until eighth-generation production ended with the 1985 model year. Eighth-generation Eldorados definitely have a following—and values are sliding up. According to Hagerty’s valuation tools, all the money for a 1982 Eldorado in #1/Concours condition is $14,900, with a more normal #3/Good condition car going for $6,400. Eldorado Touring Coupes sometimes show up for sale in the Hemmings Motor News classifieds and on eBay Motors. There was only one color available for the 1982 Eldorado Touring Coupe (later years had more choices), so make mine Sterling Silver. I owned a 1982-83? 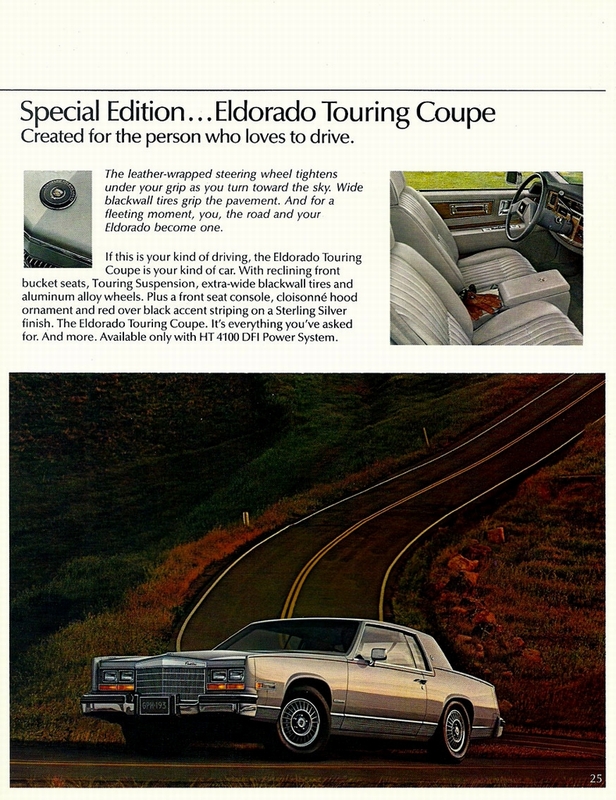 Special edition Eldorado Touring Sports Coup. It was grey, silver. Roof had half leather. Electronic speedometer. Flashed at 135 mph? Topped out at 150. Tire on trunk. Sunroof, cb, all leather interior, large grill. Paid $33 grand. Best car i ever owned. Wish i had it back.